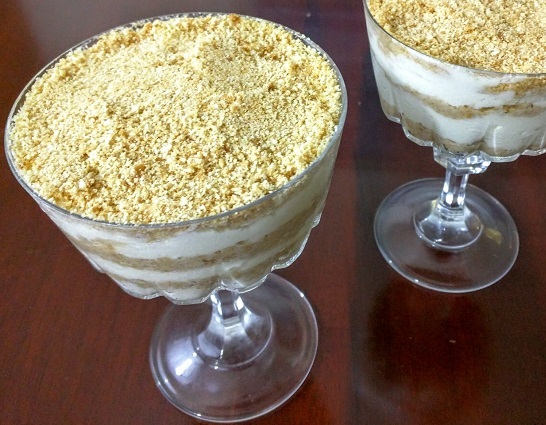 Serradura, also known as Sawdust Pudding, is a wonderful Portuguese style dessert originating in Macau during the time when it was still a part of Portugal. Serradura is a wonderful sweet treat that utilizes some heavy whipping cream along with crumbled Bolacha Maria cookies in order to create an elegant chilled dessert. This dessert is unbelievably simple and easy to make and only requires four easy to find ingredients. Despite that, Serradura is a very refined tasting dessert that is always sure to impress and perfect for serving any time you have guests around. 1) Grind the maria cookies into a fine crumble. 2) In a bowl pour in the heavy cream and with a spoon, stir it well until it forms peaks. 3) Once the cream has peaks, pour in the sweet condensed milk and vanilla extract and continue stirring until the mixture reaches a smooth and even consistency. 4) Now begin pouring in a layer of the cream into a serving glass. 5) After pouring in a layer of the cream, do the same with a layer of the maria cookie crumble. 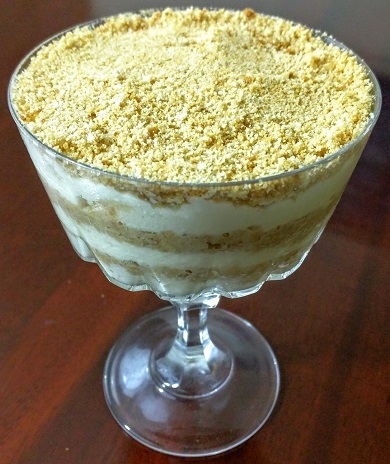 6) Repeat the process of adding the cream and then the maria crumble until the top of the glass is covered with a layer of the crumble. 7) Once done, place the serving glasses in the freezer for 2 hours to chill. Once ready, serve.